In 2015, Hendrik released two new instructional DVD titles bringing the total to 16 productions. “End Grain Table Tops & Cutting Boards” is the second DVD newly released in 2015, but let us first hear about the long awaited production: “Handcut Dovetails”. Previous videos have covered a wide range of machinery skills, as well as how to tune and sharpen hand planes and chisels. However, in this new production Hendrik shows you how he cuts the time-honoured dovetail joint fully by hand using only a dozuki saw, chisels and hand planes. “Handcut Dovetails” covers his step-by-step techniques over a 7 hour span spread over 4 disks. As is Hendrik’s usual style, this DVD set is a detailed step-by-step course – not the “usual” DVD fare that may have disappointed you in the past. The DVD starts by reviewing some of the equipment you will need to cut dovetails by hand, such as marking gauges, dovetail markers, chisels, hand planes and so on. He explains his favourite tools for the process and why, including his preference for a rip-toothed Japanese dozuki saw. If you prefer to use a western style dovetail saw, the lesson is still fully applicable to you. However, Hendrik always explains the reason for his preferences when it comes to tools, balancing quality and price at the same time. Chapter 2 covers Hendrik’s approach to spacing dovetails. Armed with his easel, he explains how to get from the rough dimensions of your project to choosing the number of pins and tails and what sizes to go with. Chapter 3 covers marking of the tails, which involves very precise pencil lines for the shoulder and tails. He also discusses the dilemma of deciding whether to mark the shoulder lines with a deep marking guage scribe, making it difficult to remove later, or to score it lightly and risk not being able to see it. Hendrik’s compromise involves a very faint marking gauge line only in the centre, followed by a thin pencil line drawn with a square. It’s an unusual approach, but does the job with numerous advantages. Chapters 4 through 8 cover, in great detail, how to cut the tails with the dozuki saw and how to chop out the waste with chisels. Then Hendrik shows you how to carefully mark the tails onto the pin board using an awl and pencil lines. From there, he deftly cuts the pins with the dozuki saw and chops them out with chisels. Chapter 9 involves the final fitting and glue-up. Hendrik explains his approach to fitting dovetails while showing you how to decide where to pare more wood or not. He shows you how to control your chisels in subtle ways and stay safe at the same time, since razor sharp chisels can be almost as dangerous as machinery in the wrong hands. Then Hendrik shows you how to make some simple clamping cauls, apply the glue and drive the joint home with authority. Chapter 10 involves trimming of the glued up joint with hand planes, starting with a low angle block plane to deal with the end grain areas and switching to a standard angle block plane at the end to avoid tear-out on the long grain. He talks about how to avoid blow-out using backer boards should you need to hand plane towards the finished joint and he also demonstrates how the tiniest gaps in your joinery can be filled until your skills improve. In chapter 11, Hendrik tackles the topic of half-blind dovetails, taking you through the differing aspects of the pin board. He shows you how to alter your cutting technique with the dozuki saw and how to remove the waste from between the pins with high precision. He has a very defined method of starting with the shoulder cut, then following up with a horizontal cut, then a vertical side cut, followed up again with horizontal and shoulder cuts to sever the waste. And he shows you strategies for levelling the bottom of the pin sockets beautifully for the best odds of ending up with gap free joinery. 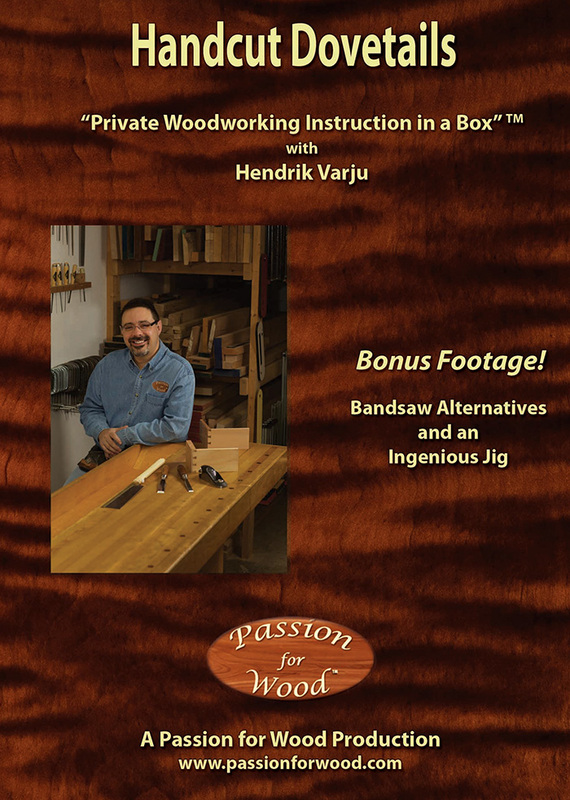 For those of you who are looking for shortcuts when cutting larger numbers of dovetail joints, or tackling huge dovetails on thicker timbers, Hendrik includes a lengthy section of “bonus footage” called “Bandsaw Alternatives and an Ingenious Jig”. Chapter 12 is called “Cutting Tails and Pins with a Bandsaw”, in which he shows you how to use a bandsaw to rough out the tails and pins, easily completing about 90% of the work. The last 10% is, of course, still done with chisels in order to achieve the best gap-free fit possible. The second bonus footage chapter is called “A Jig for Handcut Dovetails”. Hendrik shows you a jig he invented many years ago to help you cut dovetails by hand with greater ease and precision. His jig holds the tail and pin boards for you and also registers a thick hardwood guide block right on the shoulder line to guide your chisels. One of the most difficult aspects of cutting dovetails by hand involves cutting the shoulder lines exactly on the same plane on both sides of the part. This jig was designed to make this easy. You’ve undoubtedly heard of “dovetail jigs” for routers, but not a jig like Hendrik’s that helps you cut dovetails by hand with a higher level of precision on the shoulder line. The bonus footage of this DVD set runs for over 70 minutes, which is longer than an entire typical woodworking DVD! Remember that Hendrik’s productions are not just “entertainment” like a woodworking television show. These are lengthy step-by-step woodworking courses in a DVD format. Like it says on the front cover of these productions, this is “Private Woodworking Instruction in a Box”TM. In short, “Handcut Dovetails” is a complete step-by-step DVD course, bringing you a depth of information and subtle details rarely seen outside of private hands-on woodworking instruction. As of 2015, Hendrik has been cutting dovetails by hand for nearly 25 years. His first attempts at the joint were difficult and not very satisfying, but this production brings you the techniques he has been using and perfecting ever since. All of Hendrik’s productions include a wonderful mix of theory, with sketches and full explanations, married with real-time demonstrations you can duplicate in your own workshop. This is the beauty of these multiple disk courses, which give you an absolutely enormous level of detail, but in a “live demonstration” format just not possible in a woodworking book or magazine article. As always, Hendrik’s DVD courses are not like the usual 45 to 60 minute production you may have found disappointing in the past. Hendrik takes you through every procedure in real time, ensuring that you fully understand the thinking behind every step. Most woodworking videos and television shows just show you the “gist” of each technique, editing away the finer details and problems that might arise. If you truly wish to elevate your handcut dovetail techniques to a professional level, the details are everything. Normally, Hendrik can only cover all of the high-level details he loves to teach in person, but he has once again succeeded at giving you personal coaching in a DVD format. As a 4-DVD boxed set running for nearly 7 hours, “Handcut Dovetails” will become the leading instructional woodworking DVD in this area. As the trademarked name says, this is “Private Woodworking Instruction in a Box” TM and nothing short of Hendrik’s in-shop seminars and courses even comes close.